Sparta | Comics I Don't Understand - This site is now being updated daily at http://www.comicsidontunderstand.com. Please change your bookmark if necessary, and notify any web site with a link to the old address. Watch 300… it’ll make sense. Another candidate for the “this joke would have been funnier six months ago” award. How about a “don’t assume everyone sees popular movies” award? This went totally over my head. If eric hadn’t mentioned “300”, I’d still be lost, even though I still don’t get it. For instance, I understand that Joe is saying “this is madness” to set up the “this is sparta” line, but it doesn’t make sense to refer to replacing a PC and printer as “madness”. Whatever. I can see how it is tempting for an artist to make pop references like this, but they should at least make sure the catchphrases have actually made it to the masses, like the popular quotes from “Forrest Gump”, which I’ve also never seen. Jim, I can’t fault Robb Armstrong here on this: You’re never going to find a reference point that everybody can share — and there is, after all, the CIDU Page for those of us who need a hint. Probably the best thing every written about 300 writer Frank Miller, by the way, was by David Willis. Well, even if you didn’t see 300, that particular scene was in all the trailers and commercials, so it’s certainly not unreasonable to expect people to be familiar with it. Or, at least, it wouldn’t have been 6 months ago, as Shire pointed out above. Man, Joe and Marcie look HORRIBLE. It’s like they had botched plastic surgery. I stopped getting the strip at the millenium, and every so often when I DO bother to check it out, every thing changes more than a soap opera. OK, so for those of us who have not seen the movie, the trailers, or the commercials, would someone please explain the joke? The gihugic Persian army of Xerxes is on its way to crush Sparta. This advance Persian emissary comes to visit the Spartan king [Leonidas] and ask him to submit to Xerxes’ rule rather than be crushed. Leonidas walks with the guy, considering his response, until they are at the edge of a huge well, which is inexplicably found in the middle of a town square with no railings around it. Leonidas responds “This! Is! 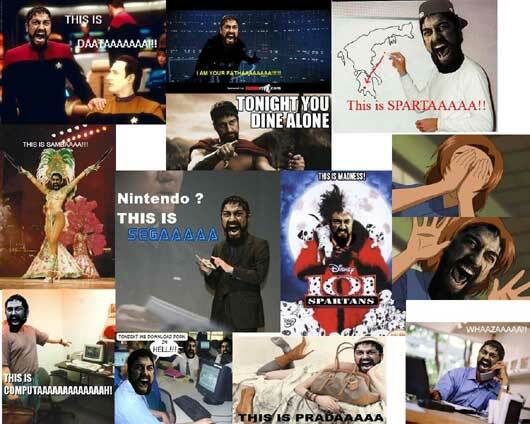 Spartaaaa!” and kicks him in the chest, knocking him into the well. Okay, NOW it makes sense after reading Chaz’ comment. It might have been funny to me if I had seen the movie or the trailers or even the commercials. Respectfully, though, I am going to have to fault Armstrong for this, because I don’t think Joe’s comment is something people will say when confronted with replacing their computer and printer. It feels that he forced the gag, which is never funny. I see it all the time in otherwise clever strips like “Get Fuzzy” and “Pearls Before Swine”. I don’t want to over-analyzing anything, especially humor, but a gag should evolve from the situation. It’s always obvious to me when a character is saying something for no other reason than to set up the gag. It seems like the author decided on a punchline, then worked backwards to make it “work”. I saw this a lot on “Will and Grace”, too. It’s just funnier to me when there’s a logic and “flow” to a strip’s narrative. Otherwise, you could make a comic strip just by drawing the last panel with whatever punchline you want, then just filling in the previous panels with random comments and actions. Just sayin’. Okay, NOW I get it after reading Chaz’ comment. But I don’t think I would have found it funny even if I had seen the movie, the trailer, or the commercials. And I do have to blame Armstrong, if not for the “assumed popular” reference, but for the break in logic between the first two panels and the last panel. This is the problem I have with most of the CIDUs I send in. In this case, it’s obvious to me that Armstrong wanted the “300” gag in panel three. He needed a setup for Joe and Marcie. Fine, but where it breaks down for me is that no one would normally say “this is madness” when confronted with the prospect of replacing a computer and printer. Yes, I know that’s the only way the gag could work, but that’s my point. He forced the punchline. It’s like he started with panel three, then worked backwards and had to do something to make it “work”. I see this fairly often in otherwise clever comics “Get Fuzzy” and “Pearls before Swine”. As bizarre as the settings of those strips are, there’s still a logic and flow, and it’s jarring when that’s interrupted. It’s always obvious to me when an author works backwards like that, and it’s never funny, just embarassing. I saw it on “Will and Grace” quite a bit, too. I mean, if that’s all it takes to make a comic strip, I could just fill my panel three with my movie-reference or bad-pun punchline, then fill the previous panels with random dialogue and actions. Whew! Sorry! I don’t like to over-analyze anything, especially humor, but I just think humor is funnier when it evolves from the characters’ established personalities and actions.